First and foremost, business is about people. You need them to own your business. You need them to operate your business. You need them as customers. You cannot do business with out people. And you cannot do business without respect and concern for those people. There are so many people out there in business who are cranky and rude to their customers. And I’m not sure how they ever stay in business. Because they could be so much better off if they were nicer, and more pleasant, and more courteous to their customers, than they are being. But it’s not just about the customers. Being nice comes from within. And it needs to be conveyed to all and everyone you encounter. The aim or goal of every business is to build a gaggle or crowd or herd of happy smiling customers so loyal that they visit more, spend more, buy more and refer more others to your business, more than the average business of your type has. In dentistry that’s not difficult. Because in dentistry all you have to do is be nice, and act nice and people will beat a path to your door. If you can’t be a nice person in business, then you need to surround yourself with nice people and get out of their way. Well out of their way. Which is really difficult in dentistry. Because everyone in the Dental Office has a role, a vital role to play interacting with the customer as they journey through the Dental Office. As I worked my way through High School and University I worked in two industries. Actually I only ever had two jobs. Before I became a dentist. I worked in a Newsagency, and I worked in a licensed club. And in both jobs, I encountered people working there who were their own worst enemies when it came to dealing with people, and being pleasant. And in both jobs, I learned, that you need to be putting on your “Happy Face” from the moment you get there to the moment you leave, otherwise people aren’t going to like being around you. And I saw this in both jobs. In the newsagency we had two owners. Well actually the newsagency was owned by two different owners. When I started working there it was a mother and her three adult sons who owned the shop. And it was a big shop. Newspapers, gambling, toys, stationery, cards, wrap, pens. You name it they had it. But within a year of me starting there the store was onsold to two brother-in-laws. Who were the two owners I was referring to. And funnily, as I write, these two separated their business agreement and one of the brother-in-laws left the business. Sadly, it was the nice one who left. The one who was so pleasant to work for. To be around. To talk to. And we were left with the other one. Who was grumpy, moody, surly, and dare I say, insincere. And the difference in these two was palpable. It’s interesting, because as I write, I don’t believe any of these three ownerships were stupid. I mean I don’t believe they were unintelligent. Who made dumb decisions with business. And that would be another story. But I do remember how they all made me feel. And how they all made their customers feel. Because when given the choice, my fellow employees and I would all comment that we’d prefer not to work for one boss compared to another. And maybe that’s just people. I mean maybe that’s just employees. Maybe employees are never ever truly happy. Ever happy. Maybe as an employee I was thinking like an employee. Like a person who had never been in business or owned a business or had to run a business. Because maybe I never knew what it was exactly like. To have to meet targets. And budgets. And loan repayments. In the licensed club, as an employee, it felt exactly the same. There were Duty Managers we just never ever liked to work under. There were managers who inspired us. There were managers who felt like friends. And there were managers who made your hair stand on end. Who never ever lifted the team. And there were other managers who did lift you. As a person. As a team, as an employee. So that you would naturally give it your one hundred and twenty percent. And when it was fun to be at work, it was really fun to serve. And that’s what the customers wanted. But they wanted fun. Smiles. And sincerity. And at the club, I guess the wanted to escape, too. But in both these businesses, as in all businesses, the customers just wanted people to be nice to them. And when they were, I mean when the employees were nice to their customers, the customers loved it. And they came more often, spent more, and brought more of their friends. Like we all want customers to do. But it’s got to come from within. From within and from inside, of your people. And if you’re not bringing that out, in yourself firstly, and then from within your team, you are your own worst enemy. Because without nice, you’re really pushing the proverbial uphill. You’re doing it the hard way. And with that “weight”, well that makes it even harder to be pleasant. So take a step back, and reflect. Are you standing in the way of your own business success? Are you the surly boss? Because if you are, you really are your own worst enemy. Or get out of your own way. Your patient is paying for your time. You need to be giving them value for their money. You need to be providing them with exceptional value, so that time, and money become irrelevant. I’ve reported it before and I’ll say it again. Until I’m blue in the face. The number one reason our dental patients leave our Dental Office is because of apathy, and perceived apathy, by dental team members. Are you guilty of being disrespectful of your patient’s time? But are you and your team continuously guilty? Here are some classic examples of how we are failing to respect the time of the patient. Failing to acknowledge, and praise, the patient who always arrives well and truly early for their Dental Appointment. We’re always early for the train. For the bus. For our flight. So why oh why can we not be early for our patients. And them for their appointments with us? Sure. We may end up running late through no fault of our own. Another patient could be late? An impression needs retaking? An exo turns into a surgical? All of these things can throw our appointment book into turmoil. Have you ever been on a flight where the pilot says that the plane can pick up [lost] time on the journey? Airlines build flextime, or catch up time into the air time of every flight. They need to. Because they are at the mercy of air traffic control at both ends. And the weather at both ends. So if airlines can do it why can’t a Dental Office? Why can’t a Dental Office build flextime into its schedule? When our patients arrive early, we thank them. And if Mrs. Smith does come early to her appointments regularly, you better see her early as much as you can, so that she knows that you value her time. Nothing else reeks of disrespect for a patient’s time than phoning them to reschedule, or delay, an already made appointment. If you need to take time off, then plan it well in advance. So that patients are not booked into that time in the first place. And don’t even think of entertaining the thought of rescheduling patients in a time slot just because someone wants to call a meeting to suit them. A friend of mine was asked to attend a meeting at 9:00am on a Friday. To do so would have meant rescheduling patients from 7:00am to probably midday? My friend told the person he was meeting that patients came first. This sort of meeting, that disrupts an already well planned appointment book, needs to be scheduled outside of clinical hours. They’re all there. Every day. We can’t stop them. But we can minimize them. And we can strategically position them for least disruptive impact. Remember, when you are with your patient they are paying you for that time! Don’t be leaving the room every second minute. Once you’re with them, stay with them as much as possible. And keep interruptions down to a minimum. In a regular Dental Office the hygiene check is a part of daily routine. Firstly, the hygiene checks need to be scheduled in the appointment books at specific regular times so that the Doctor’s treatment room can be scheduled with minimal impaction from hygiene. As well as maximum impaction. We have the hygienist come to the Doctor’s treatment room, and excuse herself, and then announce her presence, and that delivery is scripted. No buzzers, bells or beepers. Firstly, the conversation promotes to the restorative patient in the Doctor’s room that a “please and thank you” culture is alive and well in our Dental Office. Secondly, the restorative patient is also a regular hygiene patient, usually, so they then get to see the minimal, but important impact, of the hygiene check in the Doctor’s day-to-day routine. Thirdly, if the restorative patient is not yet a hygiene patient, the verbal announcement from the hygienist allows the Doctor to “back announce” and introduce the hygienist and hygiene services. Timing the hygiene check correctly also allows the Doctor to politely excuse himself from the restorative patient, and along the way to the hygiene room, he may be able to administer local anaesthetic to his next patient, or review an ortho aligner case at the same time…. Unless absolutely critical, personal phone calls and drop in chats from friends or reps should be absolute no-nos. The patient is paying for your time. Give them back your time in spades. So that they feel that they have had exceptional value. Being constantly interrupted with announcements from staff and team members that your wife/golf buddy/etc. is on the phone is a big turn off. I remember my mum relating to me her experience at the endodontist while he took a phone call and made a stock market transaction right there in front of her while she was in the chair! If the team member must notify the Doctor, *and* the Doctor has pre-notified the team that he is expecting an important call, here is how we play it out. The team member enters the treatment room and, unannounced, and hopefully unnoticed at all by the patient in the chair, she slips a hand written note into view of the Doctor. The note is usually positioned down beside the patient’s head, so the Doctor has minimal physical disturbance. Once viewed, the Doctor can then respond with a short few word/one word/non verbal signal to the team member, and take action accordingly. Without heralding the interruption, or the purpose of the interruption to the valued patient. Discretion is the key here. Tying all this in together, if the Doctor’s day is scheduled productively using a template there is plenty of flex time available for him to return, or take those calls without impinging and impacting upon the precious time of the valued patient. And the valued patient feels that they have experienced exceptional value for their time spent with the Doctor. And they’re none the wiser. Just like at Disney, there needs to be a lot of planning to what goes on underground and behind the scenes to maximize the experience that the customer receives. Delivering a consistent way-above average experience to your clients, customers and patients is the easiest way to build and maintain a very successful Dental Office. Twenty-one years ago a Dentist friend of mine told me that children spell “LOVE”, T.I.M.E. Patients spell “LOVE” exactly the same way…. More often than not we forget, when looking at our business, that the business of dentistry is really the business of managing people. Because it’s people, and the management of them, that determines our success, or level of success, in business. Because dentistry, firstly and foremost, is a service business. Our role, as providers of dental services, is to serve. To serve the public, our clients, customers and patients with our exceptional skills in an exceptional manner. And we can’t do that on our own. We can’t complete that transaction without involving other people. Our decisions in business must be based on the experiences we want for our clients and customers, and the best possible way that our team members can deliver those experiences to those customers in a purposeful and effective and efficient, comfortable process. Arthur Blank, co-founder of The Home Depot and owner of the Atlanta Falcons, is quoted as saying the hardest part of owning a football team isn’t the business side, off the field, but rather, the on field detail. The *Business* of Dentistry involves the detailed examination and consultation with all those involved to ensure that our best results for our clients and customers are always achieved by our team on a repeatable consistent basis. We must be results focused in every decision we make in running our business. And in a positive way. So that our team, our suppliers, our support, say “Visionary!” about us, their leader, their inspiration. That’s what they said about Jobs. About Disney. About Mary Kay. It’s what they *are* saying about Hsieh. And about Schultz. The best way of growing your business is to encourage and foster and nurture the best, the very best, from your people. And that creates the best *for* your business. What this means is that we need to resist the idea of managing, and micro-managing our team. As dentists, on the whole, we are not known for our management skills and abilities. Or even worse, High C Types. We’re focused on the technical processes of dentistry, sadly, and not the social and human sides of dentistry. But dentistry, and the delivery of dental services is all about the people. And *NOT* about the dentistry. At parties, at barbeques. At social gatherings. Do you see groups of people pulling their lips and cheeks about showing their friends their forty-micron margins? Showing their friends the precision staining and glazing on their latest porcelain crown or onlay? But what you will hear them saying is how their new Dental Office made them feel at their recent visit. They’ll be telling their friends till they’re blue in the face if you made them feel bad, or spoke down to them. And they’ll also tell anyone who’ll listen how you made them feel special, when they *NEVER* ever expected it from a dentist! And that’s how to stand out in the market place. That’s how to create your differential. You see, the way I look at it, the public have the perception that all dentists are providers of equally exceptional dentistry. And the public also believe that all Dental Offices have all their systems and protocols in place. So the only way for the public to differentiate between Dental Offices is how those Dental Offices and Dental people make those patients and clients feel. And the way we as Dental People make our clients and customers feel is an outward reflection on the way we are feeling. And that’s what we need to manage and nurture for our team. To get the best from our team. Successful vision comes from developing culture. It’s the culture that we create, that we encourage, that we expect, that brings out the best from our team. And it comes from above. So if you don’t have leadership in you, hire it. Appoint it. Nurture it. Stroke it. Use it. But don’t bottle it. Or throttle it. If you’ve not got the skill of leadership, hire it, rent it, and get out of its way and let it do what it needs to do. Failing to lead, or developing true leadership, just tortures your people. When I’m interviewing dentists who need my consulting and coaching help, they often ask me the question about how I achieved an annual collection of over AUD$1.8M. And this was through my own personal production, from the exertions and efforts of my own hands. This number did not include hygienists, assistant dentists or specialists treatments, who worked alongside me under my roof. What was theirs was theirs. And when I do think back about those days, the one thing I can truly say that helped me unconditionally is that together with my great team I provided an excellent service, and a consistently excellent product in a repeated day in day out minute in minute out manner, every day that we worked. Because as I’ve said before, how good do you want to be? I want to be the best that I can. Because I’m no dental Superstar working in a ritzy glitzy town with ritzy glitzy patients. As I’ve said, I’m just an average dentist in an average town seeing average patients living in average homes earning average incomes and driving average cars. Parramatta is no Beverley Hills. In fact, it’s more akin to Dodge City than it is to Rodeo Drive. The thing is, if I can do numbers like these then there’s no reason that you can’t too, or better, using the principles and systems that I developed and learned over time. Two quotes have come across my desk this week that I’d like to share with you. They’re not new quotes. Well not to me. They’re reminders from two people in the world of Customer Service who I look up to immensely, as mentors and Evangelists for the systems and the ways that we should be conducting ourselves. And conducting ourselves, not only in business, but in life as well. The way we serve our customers, consistently and passionately, should be the way that we too behave, as customers, as well as in life, as people, as parents as friends. And it comes from the top. It is said that “A fish stinks from the head down”. To create a successful team you must create a successful culture. And lead from the front. As a leader, you’ve got to be there. And build a team that shares that belief. The belief that there is a better way. And the better way is explainable..
And this creates and develops and fosters culture. Because without culture, its all just window dressing. And window dressing at best. And your clients and customers and patients know window dressing. And they ain’t buying window dressing. And they ain’t buying phony, either. And as a Dental Office, you can’t buy that in a bottle. You can’t buy that in a coat of paint. As a Dental Office you sell it with your heart. Day in day out. Minute in minute out. I can’t sell you that system in a box. But it is a fix. It is doable, and it is teachable. But you’ve got to want it. You’ve got to want it more than anything. Disney wasn’t built overnight. Nor was Starbucks. Want it for your clients. For your patients, for your staff and for yourself. Want it for work, but want it for home. For your spouse. For your family. When you connect, and truly connect, with your clients, patients and customers, they know it. They know they’re not just as number. And you know that you’re not just a commodity to them. You know they’re choosing you. Because of you. And who you are. And what you do. And how you make them feel. And commodities don’t do that…. A friend of mine has said to me that if dentists had to form a firing squad, they’d all stand in a circle. What he means is that, when it comes to helping each other, dentists don’t seem to like doing that. There are pockets of dentistry where this is not true. I’ve been privileged to be included in some dental mastermind meetings, both in Australia and in the USA, where the theory of abundance predominates. And that is the theory that there’s plenty to go around. And the theory that by growing the pie, there’s more for everyone. More for everyone to share. And that’s how the dental market should be. Recently I was talking to a dentist I know well who was pondering about joining a Preferred Provider group. And he wasn’t quite sure. He was being serenaded with the story that once he signed he’d be inundated with so many more new patients. They told him he’d be busy. But my friend couldn’t work out where all these new patients were going to come from? And how was he going to get profitable working for fees that were half what he charged now? You see my friend is no dummy. He figures that only a small percentage of the population go to the dentist anyway, so there’s a huge market of people out there to attract who do not even have a dental home. Then of those who do go regularly, more of them don’t have any insurance than do. And a lot of those with insurance don’t have dental insurance. They only have hospital insurance. You see, people who choose you because you’re with a certain fund or PPO aren’t really choosing you. And in that case, they have no “contract” with you. Because their contract is with the PPO. So you just become a commodity. Where I live, people will line up for what seems like hours to save a few cents per litre, or what turns out to be a couple of dollars only on a tank full of gas. Because no one would work for a couple of dollars an hour? No one would run across six lanes of highway to pick p a two dollar coin lying on the roadway? But they’d waste an hour of their time sitting in a line of cars for a couple of bucks? When I was studying dentistry, I worked nights in a local RSL club. A servicemen’s club. One of my coworkers there, Phil, became my patient when I graduated, and as a reward to him for his loyalty to me, I treated his three children and him for health fund rebate only. And while I worked as an assistant dentist, they’d drive across Sydney sometimes an hour to see me, no matter where I worked, every six months. When I finally bought my own dental practice, I told Phil that I wasn’t going to be continuing the rebate only arrangement any more. I never saw Phil and his children ever again. Although they were dentally complete and really regular hygiene patients, it seemed that Phil and his family valued what cost them nothing over the relationship they had with me, which was more than just their relationship with me as a dentist. Phil taught me a great lesson. I told my friend that when it comes to dentistry, I don’t even know what some item numbers are. Or codes? 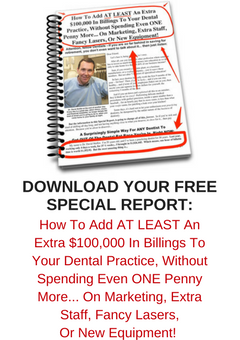 And like you all know, I produced over $1.8M dollars of dentistry in one year without any third party arrangement. And even now, working as a dentist part time, only three days per week, I collected just a shade under a million last year with plenty of holiday and education leave.